Art projects some of my girls’ favorite things to do. Often times I like to set them free with an open-ended set of materials and maybe some sort of “model project” to create inspiration. This time we got to try something a little more specific and it sparked a great little study on a very famous artist. Kidzaw.com makes studying and creating masterpieces easy with Master Kitz The Starry Night. Kidzaw looks like a great company with a great purpose to help families teach young artists about master painters and art history in a fun hands-on manner. There are several Master Kitz for you to choose from. They are best for use with children ages 5 or older although I was able to help my 4-year-old along with her project. great instructions, pastels, and a little background information on Van Gogh himself. There are three things you’ll need to add to the kit to make this project work. You’ll need a paper plate or something similar to squeeze the paint onto, masking tape, and newspaper or some sort of cover for the table. All of the materials arrived in a great box perfect for storing materials to use again in the future should you want to do that. The directions come almost poster size and are extremely easy to follow with both written words and illustrations. The included pamphlet was the perfect catalyst for a further study into the life of Van Gogh. To begin, your artist will tape down their paper and then adhere the special star stickers that are a part of the kit. After you squeeze the paint on a plate, you roll the specially textured roller through and then the magic begins. It is this roller that will help your artist create the special texture that is so associated with Van Gogh’s original painting. After, peel off those star stickers to leave negative space for creating the stars later on. This part proved more tricky than I imagined. Since the stickers are supposed to be used multiple times I figured they’d come off easily. My 8-year-old daughter couldn’t them off. Even when I tried to do it I found some of the paper tore away with the sticker. While I was able to use the stickers again for my 4-year-old daughter’s project (where we had a repeat of this problem) I do not feel they would have worked again for a 3rd project. The next step is laying down the stencil. It came rolled up in the box and I tried very very hard to flatten it and we did our best to tape it down where we could. Once the stencil is as secure as you can make it the student uses the other roller to fill the stencil with black paint. It took two of us holding the stencil down to make this work well. The effort was worth it when we pulled off the stencil to reveal the painting beneath. The directions tell you to wait 5-10 minutes for your work of art to dry before moving on to the next step which involved coloring with pastels. Our paintings were still very wet at that point so we decided to come back to it the next day. Using the included 4 pastels my little artists adding some great color and detail to their paintings. Boy were they proud of their finished pieces. While there were a few very small kinks we had to work through on the way to our finished product, we all loved this kit. It was very straightforward and pretty easy to end up with a piece of art my little girls are proud of. They had a great time on a soggy cold afternoon. It was time very well spent. I’m going to suggest some of the other kits as Christmas gifts from their grandparents. You can learn more about the Master Kitz The Starry Night we received by clicking here. Do check out Kidzaw.com by checking out their website, Facebook, Twitter, Pinterest, and YouTube. 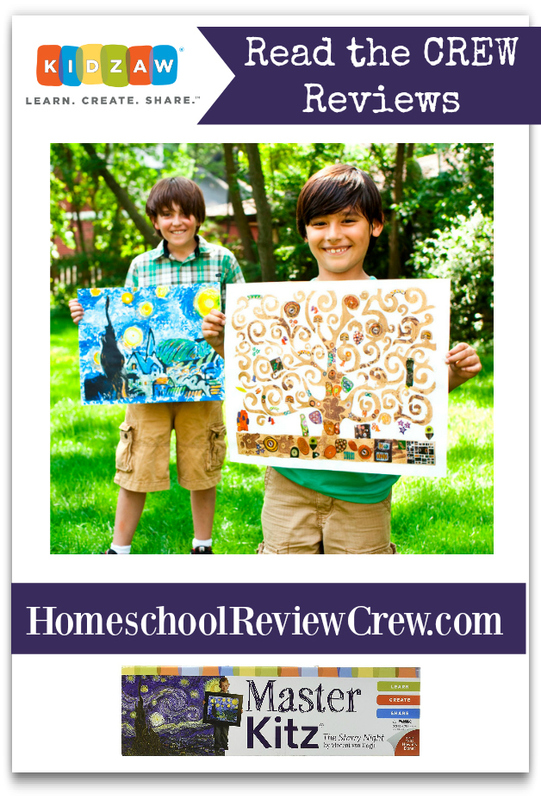 Lot’s of other bloggers on the Homeschool Review Crew got kits of their own. You can also see how their paintings turned out by clicking on the banner below to read their reviews.